Governor and local members highlight the credit union difference. 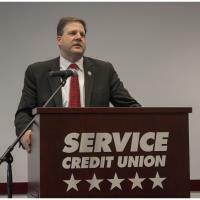 PORTSMOUTH, NH – (April 2, 2018) – State dignitaries and Service Credit Union (SCU) members praised the credit union for its exemplary service and community involvement during Service Credit Union’s 61st Annual Meeting held recently at its Corporate Offices on Lafayette Road. Sununu added that other organizations “should take a page out of your book,” because SCU treats every member as an individual. “Your group is a great example, leading by example,” he said. Webster explained that she now can focus on growing her business since she has a great business partner in Service Credit Union. “I feel so fortunate and grateful to have found Service Credit Union,” she said. Service Credit Union reported that loans, shares and assets are at exceptional levels and these financial results show 2017 was a very successful year to demonstrate the credit union’s overall financial strength. As a dynamic, member-owned, not-for-profit financial cooperative, Service Credit Union is dedicated to offering quality financial services and products. In 1957, the credit union was established to provide affordable credit to the Pease Air Force Base community. Now the largest credit union in New Hampshire, with over $3 billion in assets and 51 branch locations in New Hampshire, Massachusetts, North Dakota and Germany, we continue to serve our communities and provide a better future to our members. For more information, visit https://servicecu.org or call toll free 1-800-936-7730 in the U.S. and 00800-4728-2000 internationally.